As of today at least half of Russia is worthy of Vladimir Putin and he is worthy of that half. Our presidential election resembles a wedding. Putin has made all the preparations, including lending his face a youthful appearance, writing or having ghostwritten seven articles promising his bride – Russia – to be her defender, protector, commander-in-chief and brother. He has invited his freeloading fans from all around the country for a feast of free food and drink. But there’s a problem: the bride is split into two halves. One part of her – basically the lower half, the workers, soldiers, lackeys, those who are corrupt, couldn’t care less or, let’s face it, are simply uneducated – trembles in excitement awaiting her bridegroom, ready to give himself to him, if not forever, then at least for six or twelve consecutive years. I wonder what their children will be like. Or even whether this bride is capable of a live birth. But the bridegroom has promised her the moon and pretends to believe his own promises. He will defend Russia’s lower half from Americans and won’t let her be dishonoured. He will pivot her towards Asia telling her about a chest with precious stones that awaits her there. He’ll rush to her rescue if her dress gets torn, driving her to the hospital himself and demanding the best treatment. And should a crisis befall her, he will pick up the hem of her skirt and personally stick plasters on her cuts and apply leeches. Moreover, he will love her passionately since they share the same proclivities. Of course, as a classic male he will keep the odd thing secret from her: his income, maybe, as well as that of those of his friends who comprise his inner circle, assist him with oil and gas but prefer to keep out of the limelight. He will explain to his bride why Khodorkovsky has to sit in prison, although I think it’s quite conceivable that in his joy he will indulge Khodorkovsky somewhat, moving him from the North to a prison on the Black Sea coast. But what is he to do about his bride’s upper half, the Russia that rose against him this past winter, refusing to marry him for the third time and doing a runner from the altar? This gave the bridegroom a nasty shock. It was unexpected for him to discover that the upper half doesn’t love him, for he’s not used to not being liked. The upper half does not consist of Putin’s brethren-in-power, even though a split seems to be occurring in their ranks as well. The upper half represents the enlightened part of Russian society: scholars, distinguished journalists, writers, actors, directors, pop stars. Of course, he has a few supporters among this group, too, whom he spoils with his support and, of course, will reward handsomely for their trust. But in general, the intelligentsia says no. And the tens of thousands of young people who have come out into the streets thrust another ‘no’ into Putin’s face. Oh well, Putin must think to himself, these people have been driven wild by Western values and sold themselves to Europe. What he doesn’t realize, though, is that we have not imported these values. These have always been our values, from Pushkin to Malevich, from Chekhov to Schnittke; in fact it’s the West that has imported our Russian values, the values of our culture, rather than the other way round. Either way, the bride is now split into two halves. And there’s no way these two halves can be glued together again. One might try. But how? The bride’s upper part could be forced to marry Putin, she could be intimidated and subjugated. No sooner were a few particularly zealous members of the opposition to be be put in prison, and a few others sent into eternal exile abroad, the bride’s upper half would be in tears and in despair: after all, who wants to spend twelve years as a spinster. Life is too short. However, it turns out this bride is not so easily scared. 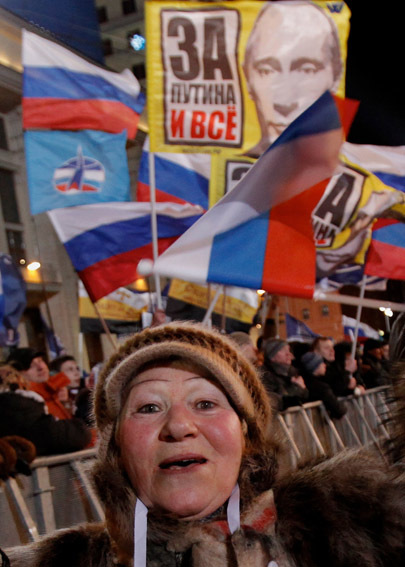 I myself heard her heart-rending shouts in Sakharov Boulevard about not wanting to marry Putin; she shouted in Bolotnaya Square too – she wasn’t afraid to scream. I wish this part of the bride and Putin would enter into a dialogue; I wish they would turn into, if not husband and wife, then at least peaceful relatives who may not love each other but don’t fight. We don’t need a civil war. We don’t need crazy upheavals, of which Russia has become thoroughly tired in the past hundred years. What we need is a calm round- table discussion. Just because Putin has castled with Medvedev it doesn’t mean the opposition is asleep and sees him castle with Khodorkovsky. We don’t need an extremist response. I believe the bride’s upper half agrees with that. She is a well-educated, smiling, ironic young woman. I saw her in Sakharov Boulevard with my own eyes. I liked what I saw. She won’t disappoint. Admittedly, she fancies other suitors. She fancies a tall guy by the name of Prokhorov, for he’s rich and won’t sully her honour. She is not inclined to reject what was best about the Soviet Union – free education and free healthcare – but she’s unlikely to blow kisses to Zyuganov. He went too far in his dalliance with Stalinism. And she’ll never shake hands with Zhirinovsky: she’s heard his campaign speeches. He talked nonsense, himself not knowing what he was talking about. Putin needs to calm down. He needs to understand that he can’t make anyone love him by force. He needs to collect his thoughts and realize that what he had been proposing in his (own or ghost-written) campaign articles are just repetitions of the promises he’s been making for years. Most of them have not been fulfilled. But what about Chechnya? I’ve ended the war there! – he’ll say to his bride. Yes, but at what cost? Chechnya has been pacified at the expense of virtual separation from the rest of Russia. The Caucasus is in ferment. Something is not quite right here. And what about Europe? Medvedev suggested we should treat it more kindly, smile more, be attractive. But who’s listening to him? And where is he now, anyway? There’s no trace of him. As for the bride’s lower half – will she be faithful until the end of the term? Will she not melt like ice-cream, emulating the upper half? She needs a watchful eye kept on her, lest she do something inappropriate, like make her own revolution in our special Russian nationalist manner. She’ll say, you’re not really one of us. Give me a Russian peasant with a cudgel! Putin has found himself between two halves of one bride. He is trying on his festive garb. He’s placing a carnation in his lapel. He’s getting married. Kiss the bride! Kiss the bride!